This is a helpful map for our Young 5 and Kindergarten parents for the 2018-19 School Year. Hope you find this helpful! Reminder: Please join us Wednesday, June 27, 6-7:00pm at K.C. Ling Elementary School for some hands-on literacy activities. We will be reading the book, The Most Magnificient Thing, then participate in a literacy, STEAM, and Makerspace activity to enhance comprehension of the book. We look forward to seeing you! With cold and flu season we thought this chart would be helpful to all! STEAM NIGHT-Wednesday, January 17! Volunteers still needed! 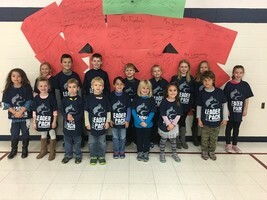 Congratulations to the October Leaders of the Pack! Congratulations to our September Leaders of the Pack! Kindergarten classes traveled to Leaman's Apple Farm! On Monday, September 25th, the kindergarten classes traveled to Leaman's Apple Farm! They learned how cider is made, went on a hayride, and enjoyed fresh apple cider and donuts! It was such a fun morning for our little huskies! Principal Lori Gensch enjoys reading to Mrs. Olinger's first grade class at KC Ling Elementary.